I have long been an opponent of modern Christianity, I don’t think that’s much of a secret. I believe there is biblical precedent for such thinking (Matthew 7:3-5; 1 Corinthians 5:12,13; 1 Peter 4:17). For this reason I have endeavored to point out the idiocy of Christianity. That being the case, I have largely skipped over the idiocy of the world. I expect the world to be stupid so it doesn’t bother me. I care very little about the creation/evolution battle raging out there. It’s an issue of faith (Hebrews 11:3) so why bother arguing it? But the other day I read this article in Wired Magazine and was stunned by the absolute goofiness of it. It makes me think that wheenie Christianity is getting a leg up because the world is now adopting our strategies! Allow me to illustrate two points. 1) The article posits that using the word “theory” is detrimental to the case of evolution. Therefore, they should just go ahead and switch the definition of the word “theory” and call it “law” from now on. This violates fairly basic principles of science to just change a word’s meaning for the sake of winning an argument. The origin of our world is still a theory and always will be because you can’t test the beginning. You weren’t there. This reminds me of Christian-arguing idiocy. When we get stuck we just pull out our Lexicons and start changing what words mean. If we don’t like what a person says about our theory of justification we’ll just change what verses and words mean until we’re right. 2) The article also states that evolution is a law because we have flu vaccines. It is childish to say that flu vaccines prove the world was created by evolution. Proving microevolution hardly proves that I’m descended from a monkey. This is similar to the idiocy of Christianity that bases spiritual principles on pure silliness. IF Sinners go to hell. AND All Democrats are sinners. THEN All Democrats go to hell. AND People need flu vaccines. THEN People evolved from monkeys. The fact that evolutionists have stooped to our intellectual level surely means we’re winning. Either that or we’re all losers. Hath not God made foolish the wisdom of this world? Author jeffPosted on October 31, 2007 Categories Uncategorized2 Comments on I Think We’re Winning! Root strength determines the tree strength. Trees can look good but if their roots are rotten the tree will stop producing fruit and eventually topple. Isaiah 5:24 points this out as well as Matthew 13 in several parables. It’s easy to be fooled by appearances and assume that “Christians” are really doing a great work for the Lord when in reality they are corrupt. Maybe we will never see the toppling, but we can get a good idea of what the future holds by examining the roots. I know some inside information on a “Christian” organization, and no it’s not the one you think I’m talking about. I’ve heard many people tell me how greatly God has used this place, how many souls were saved, how blessed they are by God to be expanding, how marvelous their works for the Lord have been. I know that the founder of the organization was a crook who frequently stole trucks, tractors, and various other things and reported them as donations. Several insiders quit because of his blatant indiscretions. I know what happened to the lives of many of those who were “saved” during their time at this organization and how it certainly doesn’t look like it all these years later. Yet the organization continues to track their amazing impact for the Lord without bothering to do any follow-up to see if it’s actually true. I know of crooked money handling situations that went on there. I know of back-stabbing divisions. I know all this and continue to be told how marvelous this group is and what a godly man the founder was. So, what do I do about it? I don’t know. I endeavor to not do the same thing myself. I endeavor to not let these things happen in the organization I work in. I hurt for people. I hurt for the church. I want to help but no one seems to need it. People believe what they want to believe regardless of pesky truth. We’d rather not examine our roots; we’re too busy. We don’t have time to deal with our facts being wrong. We conclude that the best way to deal with reality is to pretend it’s not real. So, I don’t know what to do about it. Point it out? Hurt feelings? Bring em down? Pray for em? Laugh at em? I’ve tried all the above and nothing seems to help. I don’t know. Author jeffPosted on October 30, 2007 Categories Uncategorized1 Comment on How are the Roots? A sad look at the history of the Jesus Freaks. The foul-mouthed rapper Kid Rock has this to say in Spin magazine. Story on X-games athlete’s love of Jesus. Britney, Jesus loves you. The congregation of Southland Christian Church loves you as Jesus loves you. We are praying for you. 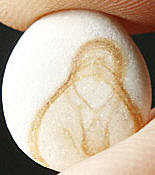 An auction for a pebble bearing an apparent image of the Virgin Mary has prompted a miraculous response with bids last night approaching $30,000.